Supplied about 1.2M tall, ready to plant out. 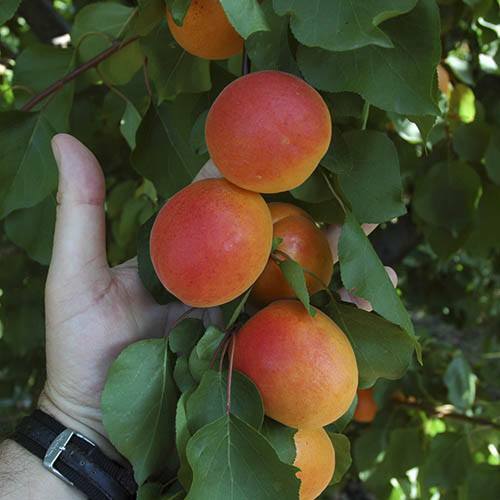 The Cot series of Apricot trees have taken the commercial fruit and gardening World by storm in the last 5 or so years, bringing exceptional crop yields and fruit quality. 'Tomcot' is one of the best for the UK climate, suited to our colder climates, where we get less accumulated sunshine, yet we get plenty of Winter chill to set buds.One of the key reasons it works well over here is it is late flowering, so avoids the late frosts that can afflict other Apricots. Yet, it catches up and still yields heavy crops of juicy, deepest orange fruits in the UK - perfect eaten when warmed by the sun straight off the tree, or for cooking and jam making. The tree is grafted onto Montclair rootstock, a new dwarfing type keeping it short and manageable. To cap it all, 'Tomcot; is even self-fertile, so does not need a partner to produce heavy crops. You will get crops in 2 years of planting, this is a great opportunity to buy a tree of the size normally available only to commercial plantations. 'Tomcot' really will deliver big crops of fresh Apricots here in the UK. Supplied as a pot grafted tree, 1M tall on Montclair dwarfing rootstock.